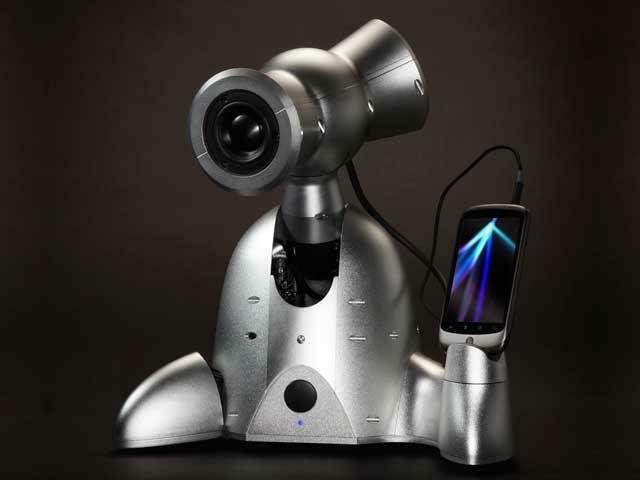 If you’re lonely on a Friday night or looking for a pal that won’t criticize your taste in music, Shimi just might be the robotic companion and personal DJ for you. Tovbot’s Shimi, developed by engineers from Georgia Tech, IDC Herzilya, and MIT Media lab, shimmies to music playing from your smartphone or MP3 player, can understand commands, and learn your musical preferences. The Shimi, at first glance, just looks like a toy — but it took the minds of weathered PhDs to program and design this rather sophisticated piece of machinery. “We saw first-hand the level of excitement and interest that we were getting from our amazing robotic musicians like Shimon. So, we decided to use our experience with those larger, much more expensive robots to create Shimi, an extremely intelligent personal robotic companion with a personality and high-quality audio that consumers can afford,” Tovbot Co-Founder, Gil Weinberg, tells us. Right away, we can recognize that the Shimi sports a “face” with speakers that protrude from the ends of its wing-like facade, resembling that of a hammerhead shark. The robot’s left foot serves as a dock for your MP3 player or smartphone, while its right foot is built for the sole purpose of tapping to the music. The Shimi’s existence is almost comical because at its core, it’s really just a glorified speaker dock for your Apple device. At the same time, it’s highly sophisticated and capable of natural language processing, machine learning, motion tracking, and its gears are silent, contributing to smooth movements that might make us forget for a moment that Shimi isn’t a robot. When you turn on the music, pivoting on five strategically placed motors, Shimi will groove to the music as it bobs its head to and fro, while its foot taps on beat with the music that’s currently playing. And no dance is the same, as its movements depend on your song choice. You can also call out commands for Shimi to play specific songs from your connected mobile device, or ask it kindly if a certain song can be found in your music player’s library or even a streaming service like Spotify, to which Shimi will offer gesture responses of “yes” or “no.” A secondary option to search for music, if you’re rhythmically talented, is to tap out the beat of the song that you’d like Shimi to play. It will for the most part recognize the beat and select the song accordingly. Using its motion tracker, it can recognize your movements and direct its speakers toward wherever you are, but according to its creators, the next stage is app development that will enable Shimi to recognize your facial expression, learn what types of music you like, and recommend new music. “Shimi will continue to evolve based on crowd-sourced ideas, including adding Android compatibility, Bluetooth connectivity and LED lighting color schemes,” said Weinberg. The creators of Shimi have taken to Kickstarter to help complete their vision. The musical companion will cost $149 for the duration of the Kickstarter campaign, although a limited supply of 100 Shimis were up for grabs at a cost of $129, until that offer sold out. Check out the video of Shimi in action below.